Most people use a locker for storage at some point in their lives, particularly in public places, such as schools, the workplace and in gymnasiums. With the addition of a lock or padlock, the clothing, equipment, products and tools inside the unit are expected to be safeguarded and secured. Yet, all lockers aren't created equally, nor are the storage solutions they provide adequate to protect personal property. That's how Folding Guard, a division of global diversified manufacturer Leggett & Platt, Inc., has continued to grow and evolve since its founding in 1962. Headquartered in Bedford Park, IL, the fabricated steel wire manufacturer designs lockers that aid in loss prevention, security and safety for customers in the industrial, commercial, government, military and consumer markets. "The lockers we make are expected to last at least a generation," says Colin Burt, Folding Guard marketing manager. "While our customers and their needs vary, the products we provide are built to last at least 25 years on average and enhance our customers' operations." 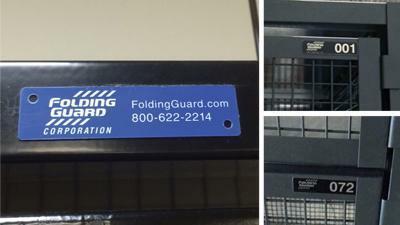 Protecting merchandise and inventory, as well as personal property, is of paramount concern to the businesses that purchase Folding Guard's products. The company offers over 800 safety and security products, many of which are customized to fit the customer's specific purpose. For instance, apartment complexes that purchase Folding Guard's storage lockers can choose different modules for the space available and decide which steel construction to use, such as an industrial welded wire or commercial expanded metal frame. Similarly, they can select various finishes, ranging from galvanized and grey enamel finishes to a palette of colors that complement different decors. Additionally, the number of shelves can also be modified from a single, double or triple tier option so that the units maximize space allocations. "Our customization features, heavy duty construction and years of maintenance-free performance are strong selling features to our customers," Colin says. "We offer eight different types of lockers among our product line, all of which are designed to be durable, versatile, economical and customizable." Ease of use is one of the selling points that customers of Folding Guard's lockers have come to expect. So, when the company sought a permanent identification solution, it wanted a product that offered the same ruggedness and lasting durability as any of its sstorage lockers. The right option would also allow the use of logos or customized images to help with brand recognition without the worry of ever needing replacement. "The product is durable and...easy...to apply." "We found Metalphoto of Cincinnati several years ago," he says. "We're able to specify what we need and MPC provides us with locker tags produced on its photosensitive anodized aluminum. The product is durable and because they are manufactured with an adhesive backing, they are easy for us or our customers to apply to the locker units." Images on the lockers tags are sealed beneath a sapphire-hard anodic layer making them virtually impervious to wear and tear. Additionally, the fact that the tags are graffiti, abrasion, corrosion, sunlight, temperature and chemical resistant means that no matter where the lockers are placed, the locker tags will be readable for decades to come.